Check out this power-sipping Atmosic chip. Image courtesy of Atmosic. One of the biggest things standing in the way of the internet of things is batteries. Billions of sensors require billions of batteries, and those batteries will require people to change them. Surprisingly, energy-harvesting technology hasn’t come too far in a commercial sense, and most of the innovations in reducing power consumption come from tweaks to the silicon. Atmosic is a startup that launched this week hoping to boost battery life with silicon tweaks and an advancement in energy harvesting. The startup has raised $21 million from investors that include Sutter Hill Ventures, Clear Ventures, and Walden International, and has built a chip that can harvest its own energy from wireless signals. Atmosic will make two chips designed for wearables, sensors, and other devices that run on batteries by combining a Bluetooth radio with a bit of processing power. Founder David Su told me that he had three ways to try to tackle the power constraints faced by IoT devices. The first was to reduce the overall operating power of the radio. This is a pretty common goal, and I’ve covered several startups that have built chips for the internet of things by making tiny tweaks in order to get more performance without drawing heavily on power. The tweaks Atmosic makes reduce the power draw five- to tenfold, according to Su. The second way the team has lowered power consumption is to change the way the radio wakes up to send and receive messages. Most chips have a sleep and wake mode to help conserve power, but Atmosic takes it to the next level. It has two sleep modes: one, which I’d describe as “barely awake,” listens for incoming transmissions; the other is “deep sleep,” which only wakes up when incoming transmission are coming in. The idea is that with these two modes, the device can improve battery life by anywhere from 10- to hundredfold. Atmosic is making one chip that combines the first two elements and will work with batteries. The second chip will include those elements and add Su’s third idea for creating battery-free chips. 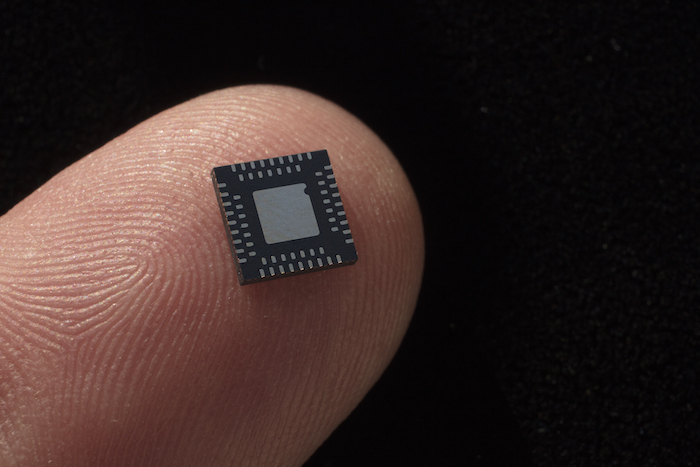 This chip will add energy harvesting for battery-free operation. It will harvest minute amounts of power from the Bluetooth radio signals coming into it. The tech behind harvesting energy from wireless signals isn’t new; the current Qi wireless charging standard uses it. However, in those cases the devices being charged have to touch the charger since the greater the distance the wireless signal travels, the more power it loses. If engineers raise the level of energy to increase the distance, they create heat. A lot of it. But Su says with Bluetooth, the radios are close enough and the power needed is so low that the chips can harvest energy over the air at relatively small distances. I asked Su how the charging affects the battery life of the device providing power to these radios, and he said it shouldn’t have much of an effect. That seems to violate the laws of physics, but I’m wiling to wait for actual devices. But while I’m eager to see how this tech performs in the real world, these chips won’t be in volume products until the middle of next year. That means we won’t see them in devices until the 2019 holidays or, more likely, 2020. Realme 2 Pro leaks ahead of launch, is it the Oppo F9 Pro?